Winter is Coming: How to Survive the Shipping Season Ahead | Samuel Shapiro & Company, Inc.
As summer winds down and winter approaches, so too begins the eCommerce Holiday Shipping Season! If you were a seller during last year’s holiday season, you likely remember the rush to get your goods out from your suppliers amid, space tightening, peak season surcharges, general rate increases, trucking timelines, customs exams, and the all-important final delivery to Amazon or fulfillment warehouse of your choice. To guide importers and exporters through a successful shipping season, we’ve compiled tips and tricks to help sellers prepare for the blizzard ahead. Why do I need to ship so early? Shippers targeting the top digital shopping days should have their cargo on the water early enough to account for sailing time, port congestion, domestic drayage, and fulfillment warehouse delivery appointment slots. The eCommerce market continues to grow with no signs of stopping, and this means more and more sellers are fighting for lessening vessel space and delivery appointments. Growth rates are in fact so high that in October of 2016, Amazon announced that it would not accept any new sellers prior to December 19th. Shipping as early as possible gives you time to ensure your goods arrive before the holiday fulfillment cut-off dates. Last year, Amazon’s Christmas delivery cut-off was on December 4; however, given the significant and often unannounced changes to Amazon’s warehousing requirements and fees, we suggest allowing for as much buffer time as possible for direct-to-Amazon deliveries. We will be posting Amazon’s deadline schedule in mid-August. China, the hub of eCommerce manufacturing, goes on a 1-2 week national holiday with limited to no freight moving in or out of major shipping routes. Capacity and pricing run rampant before and after this bottleneck every year, so take care to fulfill orders in advance and communicate expectations with your supplier. Check back to see Amazon’s shipping deadlines when announced! Peak season is the one time during the year that carriers can try to force market conditions in their favor and make up for the losses they’ve experienced during periods of lower demand. Knowing that most international sellers, including behemoths like Walmart and Target, are all trying to get products to market, carriers routinely pull vessels out of circulation to restrict capacity in high volume routes. The economics are quite easy from there; high demand + restricted supply of capacity = rate increases. In addition, steamship carriers typically try to implement general rate increases (GRI) and peak season surcharges (PSS) twice a month during this period. These charges vary and are usually mitigated depending on market demand, but can range anywhere from $200-400 per TEU and $8-14 per CBM. It’s important for sellers to build in a buffer for these increases in shipping costs. 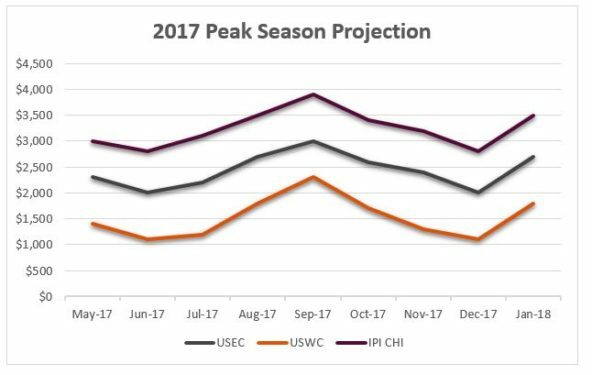 Here’s a look at Shapiro’s peak season projections for 2017. September: Expect another PSS/GRI and if vessels continue to stay full, it will stick as well. This will cause rates to max out by mid-September. By October, rates will begin to decline. By the end of 2017, rates should be back down to June levels, and we expect this to continue through CNY. For CNY, we expect rates to be at August ’17 levels. During this time, freight carriers have been known to roll cheaper bookings in favor of bookings made by their larger clientele or those willing to pay a premium. For example, if you are paying $1,300 to ship your container, but another seller has agreed to pay $1,450, the carrier has the right to hold your shipment and put it on the next available sailing while giving the space to the competition. When getting a quote from your freight forwarder, be sure to indicate if a premium service is required. To avoid the risk, we suggest shipping early, and if your freight gets rolled, consider it free warehousing for which no payment to Amazon is required. Let the space wars begin! 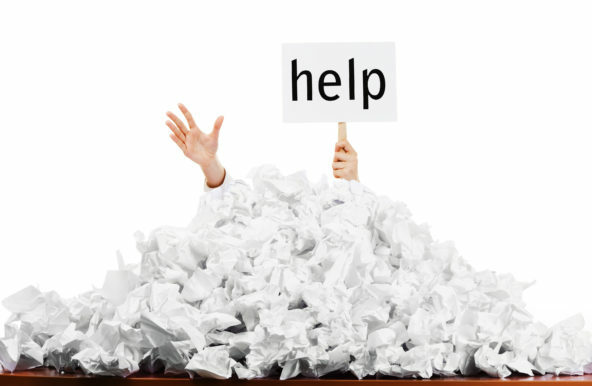 Once your goods arrive, you should always consider both the time and cost crunch that a Customs (or other government agency) exam can inflict on your shipments. Depending on the type of examination, clearing a shipment through the necessary regulatory agencies, such as CBP, can be immediate, take a few days, or even last a few weeks. This summer, we have seen unprecedented exam times in Savannah, Baltimore, and Norfolk. If you are a first time importer, or have experienced consistent examinations in the past, take care to pad your timeline accordingly. Less than full container load (LCL) shipments can often experience a higher rate of examination because of the diversity of freight packed into the container. When combining freight with unknown shippers and commodities, it’s a game of chance as to whether any of the bundled freight is subject to a targeting enforcement. To answer the next logical question, no, Customs does not disclose examination targeting criteria to the trade community due to national security risk. What we do know is that elements such as shipper, importer, tariff number, and country of origin or export are all taken under analytical consideration. Under 19 USC 1467, Customs has the right to examine any shipments imported into the United States, and you, the importer, are required to bear the cost of any resulting exams. For more information about Customs exams and their costs, check out Shapiro’s Examining the Issue: A Behind the Scenes Look at Customs Inspections and Examining the Issue (Part Deux): Customs Inspection Questions Answered blogs. Finally, you want to consider domestic drayage and the delivery appointment to your fulfillment warehouse of choice. Most often, a less than truckload (LTL) carrier is used, especially for full container shipments delivering to multiple warehouses. As the new class of Panamax ships arrive in U.S. harbors, the ports are increasingly congested as more containers arrive with each vessel. This places particular strain on port laborers as longshoreman work to unload the vessels as quickly as possible and ensure the boats remain on schedule, while truckers remain booked over a week out to pick up the waiting cargo. Importers should add cushion for driver wait time as truckers now charge for these delays. Because of Amazon’s strict warehousing policies, truckers must schedule and meet very tight delivery appointments and the noose only tightens during peak season. During the holiday rush, Amazon can delay appointments up to 2 weeks with everyone at their mercy. While Amazon does allow for evening deliveries, drayage carriers charge up to $500 extra for deliveries outside of normal business hours. This is the most frequent cause of angst for sellers that we see. Failure to consider this timeline in your planning could result in missed holiday cut offs, leading to missed holiday sales. We hope this information helps prepare you for the holiday shipping rush ahead and compels you to consider all the elements that can affect your shipping deadlines. If you have any questions, or would like to learn more about our eCommerce shipping services, please contact us at ecomm@shapiro.com.